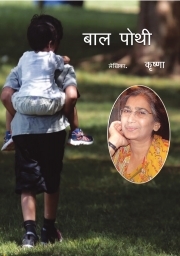 Description of "Bal Pothi "
9 short stories written in Hindi for children. Let the younger generation feel the power of Hindi language and fall in love with it all over again. An interesting way to catch up with words which are gradually disappearing from our vocabulary. Krishna Gupta is a simple lady who is very talented poet and writer. She has never published her books on a large scale. Her writings in Hindi brings out her love for the language . Reviews of "Bal Pothi "